First published in the Eastern Daily Press, Norwich, England 29 March 2012. Reproduced by kind permission of the EDP and of the artist Tony Hall to whom Copyright belongs. Further reproduction strictly forbidden without permission of the artist. 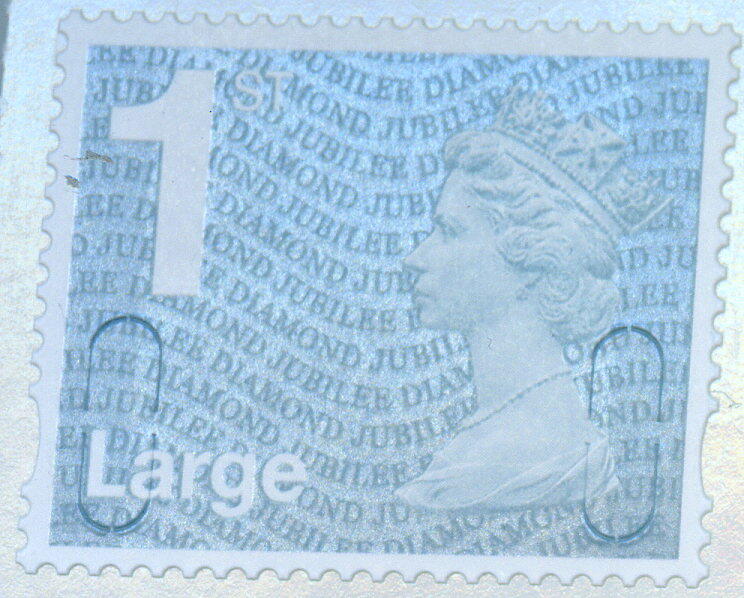 Further to our encouraging message on Monday regarding the release of the Large Letter Diamond Jubilee Machin Definitive Stamps we understand that Post Office branches were instructed today to remove from sale all Large Letter Diamond Jubilee stamps! 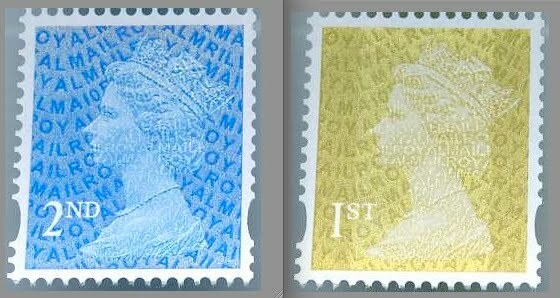 However given that many branches have no 1st gold Large Letter stamps - and I'm told that some at least had a similar message last week(!) - it seems unlikely that they will comply as to do so would mean that they were unable to sell those stamps to customers. 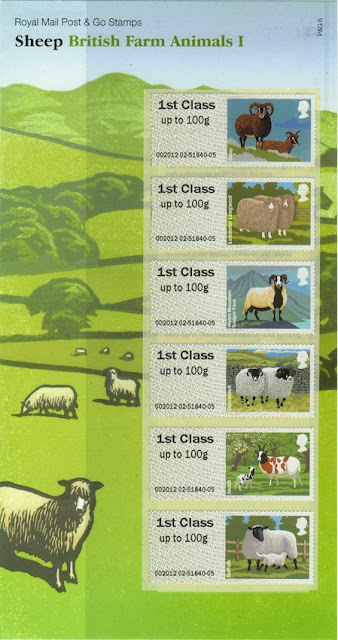 If stocks of the gold stamps are available at the stores in Swindon, it shows an alarming ineptitude in stock control. Despite the clear authorisation by Post Office Ltd two days ago, Royal Mail are suggesting that the current sales are unauthorised. If this is the degree of co-operation when both are part of one business, what level of co-operation will there be when Royal Mail is privatised? 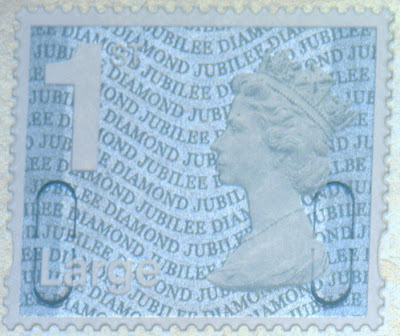 PS: At the time of writing, Royal Mail say that the 1st class Large Jubilee stamps will be on the same first day cover as the new airmail tariff stamps (87p, £1.28 and £1.90) dated 25 April 2012. 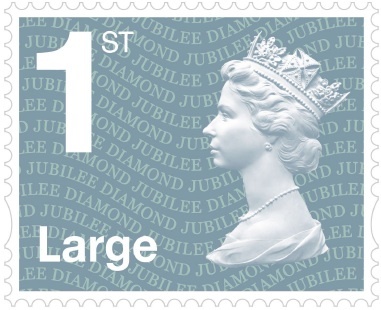 Update 16:46 28 March on twitter: from Postoffice "Hi Ian, we are still selling the Large Letter Diamond Jubilee stamps." 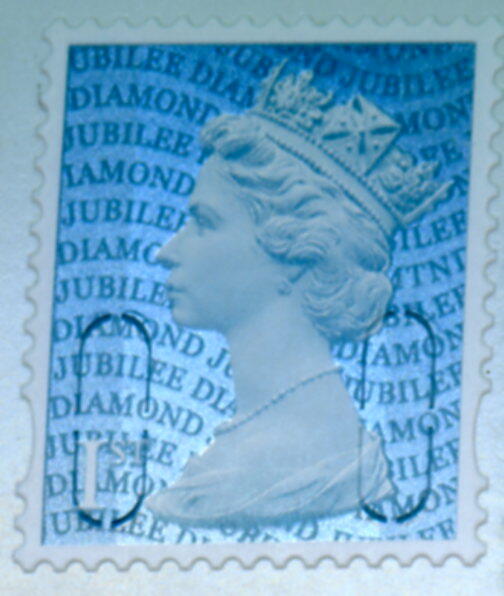 Post Office Ltd have officially confirmed that the Large Letter Diamond Jubilee Machin definitive stamp will be on sale at all branches from tomorrow, 27 March. We believe that, aside from those branches that are already selling them, the Business Sheet and Retail Booklets will not be on sale automatically tomorrow as branches will only receive these when the order them to replenish stocks. 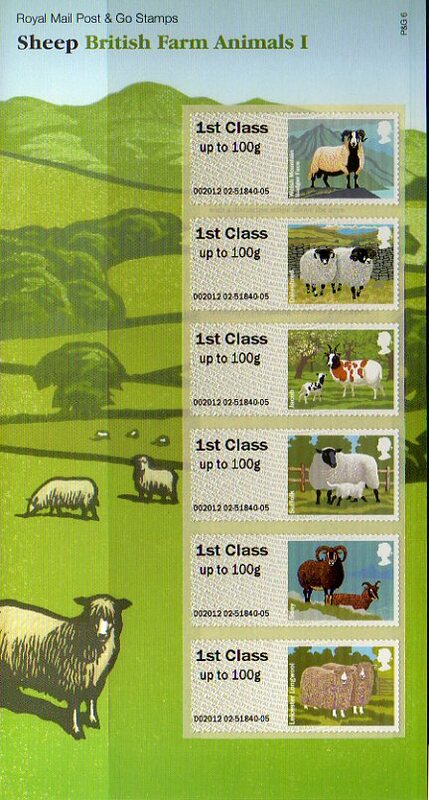 But you should, from tomorrow, find the counter sheet stamps are available even if the branch still has stocks of gold 1st class Large. 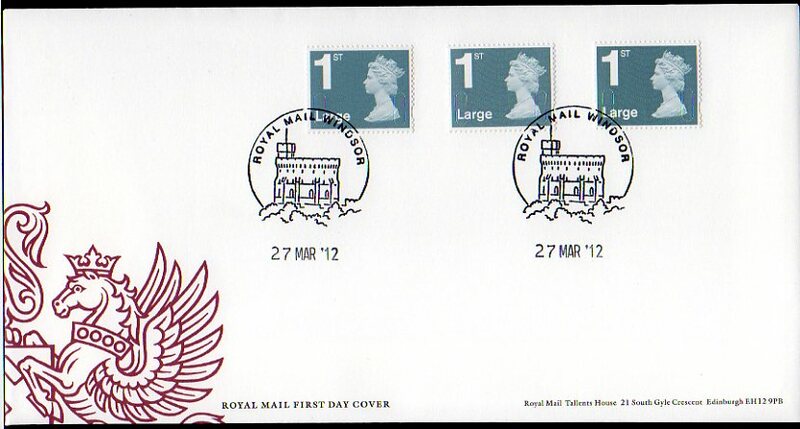 We still have no information about the official position regarding Royal Mail first day covers for this stamp. Regarding the FDCs we understand that the official FDC will bear 87p, 1st Large, £1.28 and £1.90 in that order, reflecting the 1st Large new value of 90p even though when issued it's face value will be only 75p! Update: here is our FDC with the three different Large Letter Jubilee stamps. 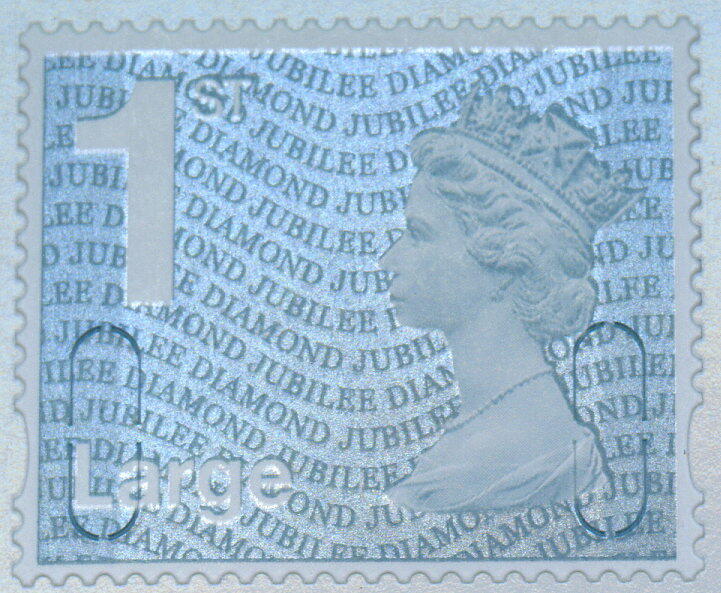 Large Jubilee definitive business sheets have been seen on the eBay auction site this week, meaning that we are now only waiting for the retail booklets of 4 to make an appearance and there will be little point in going through the pretence of having an official first day of issue in April ! And we have had more reports of the counter-sheet stamps being sold or received on letters. 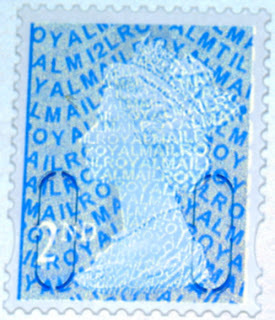 Meanwhile also on eBay after the report of a 2nd class Sunday Times coil piece being sold for £113, a second example has been chased up to £129.66 in ten bids in a listing where bidders' identities were kept private for some reason. Given that eBay hides the bidders' user-IDs through a a*****d code all this move by the seller does is hide how many unique bidders there were. More people are finding these and I suspect the number now known about is around 30, although one dealer was reported to have 40 in stock. This has not been verified and I suspect there may have been some confusion with the gummed coil version. Miscut Sheep Faststamp Packs are becoming more common - or at least they are being advertised for what they are by the sellers rather than being 'discovered' by knowing buyers. 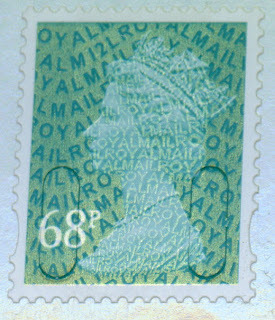 Royal Mail Tallents House must be surprised at the additional orders they are receiving, from people trying to get a different version to the one they were originally sent! And over the weekend this blog passed 300,000 visits - thank you all for your interest, and keep sending the reports! Post Offices sell Large Diamond Jubilee Machin stamps early. "1st class Large versions will be issued in March or April when the new tariff stamps are issued." 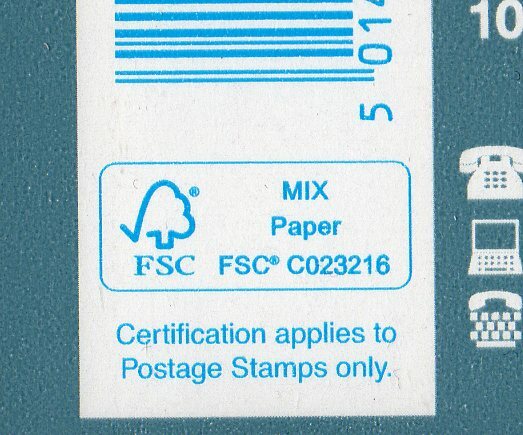 The (in)famous Sunday Times Wine Club stamp, the 2nd class self-adhesive coil from the 2010 printing, has recently made a couple of appearances on online auction site eBay. Remember if you see one offered for sale, or find one yourself, that if there are no security slits, this is from the gummed coil, not the self-adhesive. 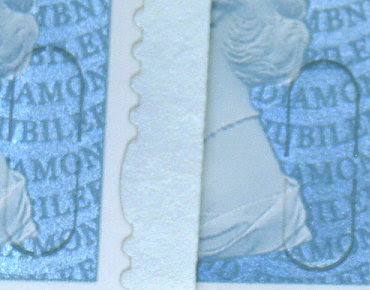 The perforations on vertical sides will be cut, and probably short; those at the top and bottom may be guillotined or torn. 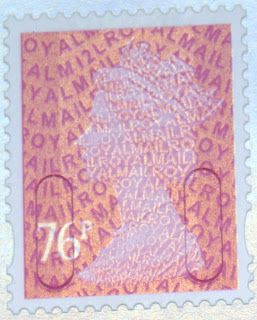 Although Royal Mail provide plenty of publicity for their special and commemorative stamps, and other collectables, details of Machin definitives are often only provided if we ask - and not always then. 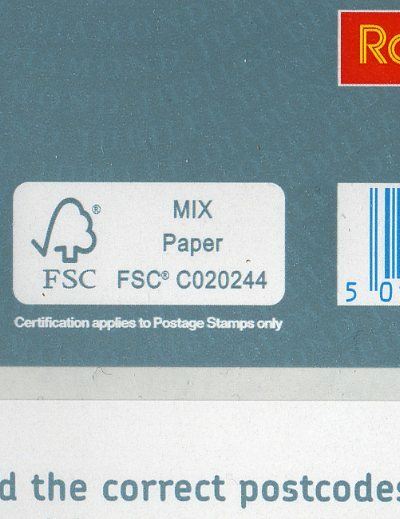 We have already reported that the new M12L printing of the 2nd class Machin stamp is printed by Walsall Security Print, rather than De La Rue (who have probably been busy printing new airmail rate stamps). 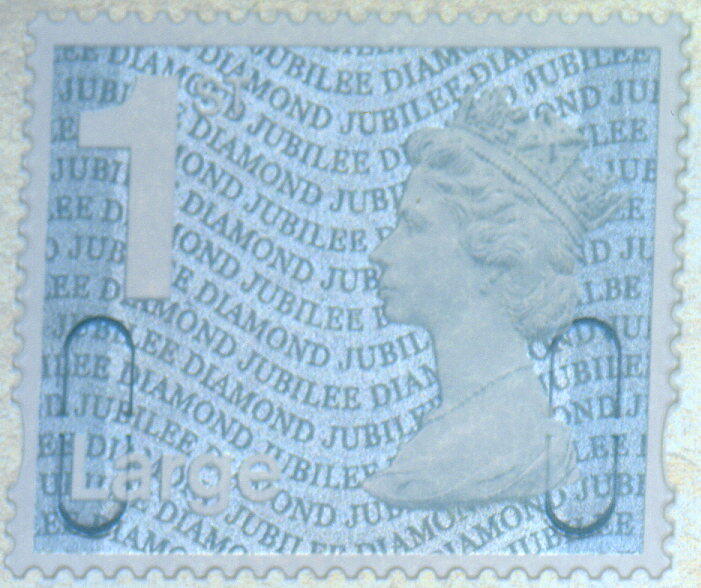 Now we have a suggestion that the Diamond Jubilee 1st class stamp in Business Sheets - issued only on 6 February this year printed by De La Rue - has now been printed by Walsall! The gap in the security cuts is clearly different. We don't yet know the printing date on the Walsall printing. 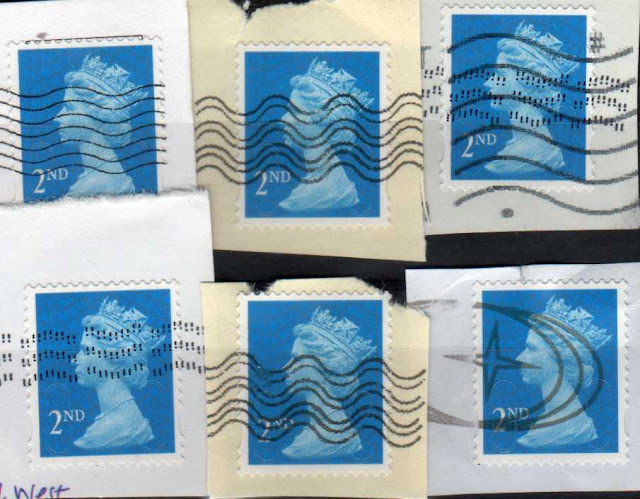 This is the Walsall-printed retail booklet of 12, with code MTND referred to by Anonymous in the comments. The Farm Animals Faststamps (Post and Go stamps) available from Royal Mail and some Post Offices were not printed wholly by Walsall in gravure as the Birds were, but had the service indicator etc overprinted using the Hytech dispensing machines used previously at Stampex, on basic Walsall stock as supplied to Post Offices for their Wincor Nixdorf machines. However the stamps dispensed at Stampex, and the packs we received, have the Welsh Mountain Badgerface at the top. 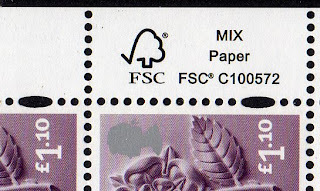 This is because the description printed in the pack has that breed at the top. 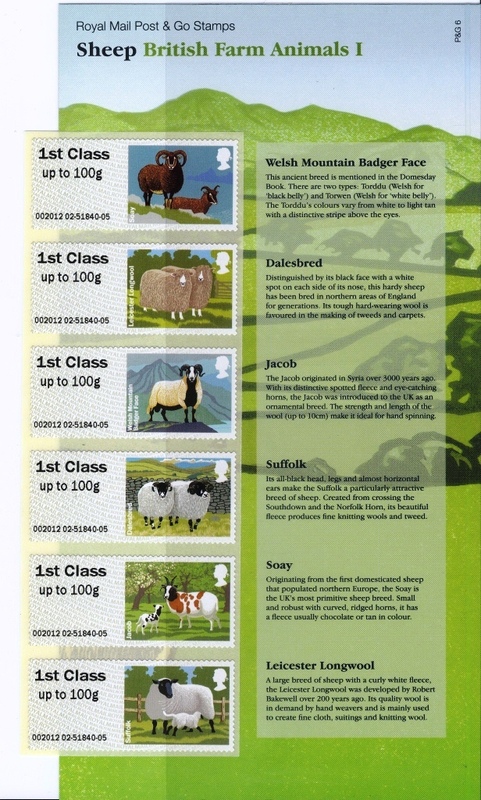 Nonetheless, some packs have been produced with strips miscut with the Soay at the top! 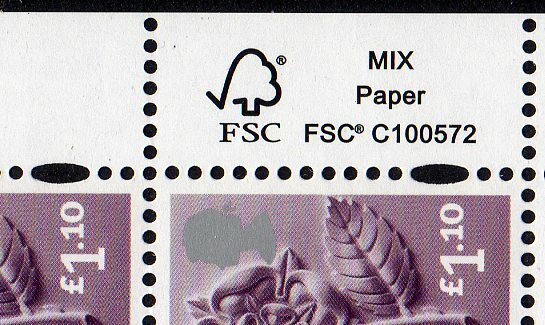 Despite assertions by some that all registered dealers received the miscut packs, this is not the case and I know of at least one* collector who received his as part of his standing order. So check yours! Is there no end to this?? 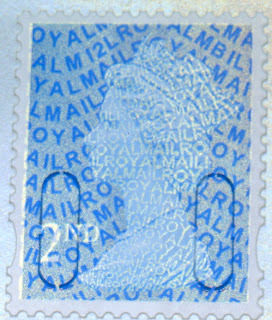 At least three Royal Mail customers have received their orders from Tallents House with yet another variation of the miscut, with the Suffolk stamp at the top of the strip! 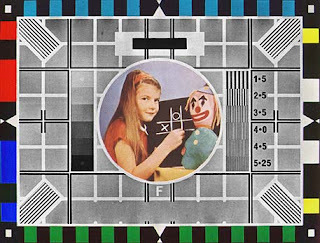 Thanks to Kevin for this image. 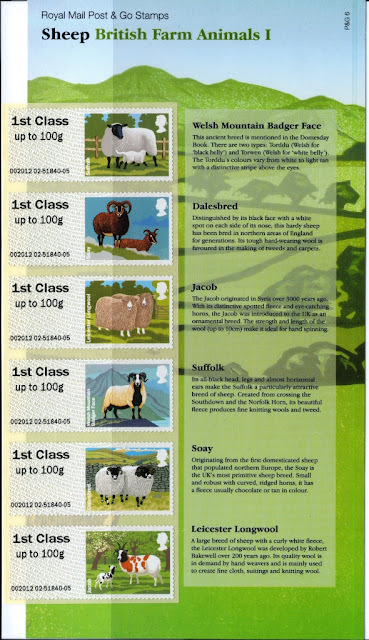 And another: MikeE has reported that his pack has the Dalesbred stamp at the top of the strip! 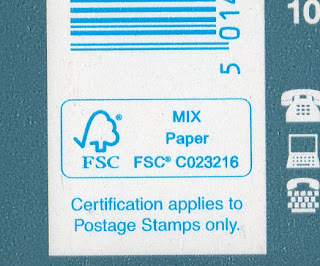 A week after Stampex, and all Faststamp FDCs are done and off to the handstamp centres, almost all emailing up to date, so it's time for a blog update, and there's a lot of news. We have a small quantity of both of these which are being allocated to existing customers first and will be added to our online shop when we have more supplies, together with the other values as they are available. 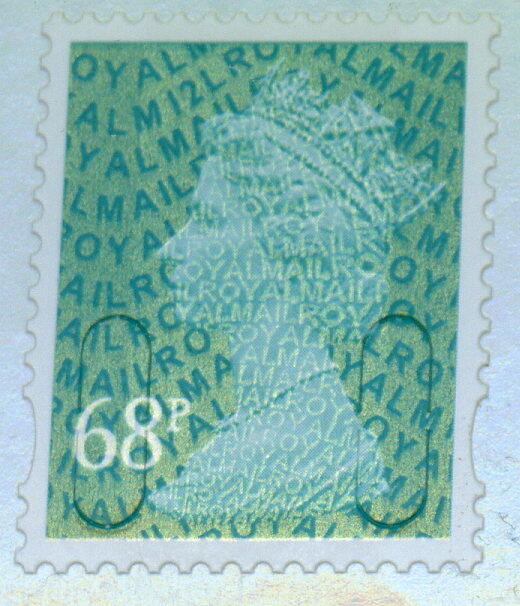 The 68p M12L stamp was reprinted on 25/01/12 and as its life is short (only until the rates change) you should look out for it and the others at post offices. Thanks to Richard P for the images! 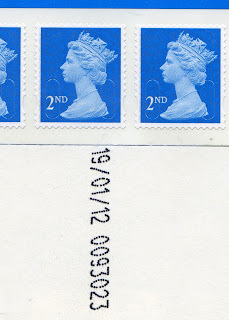 Date watchers have been mightily confused by Royal Mail's policy on Year Codes! 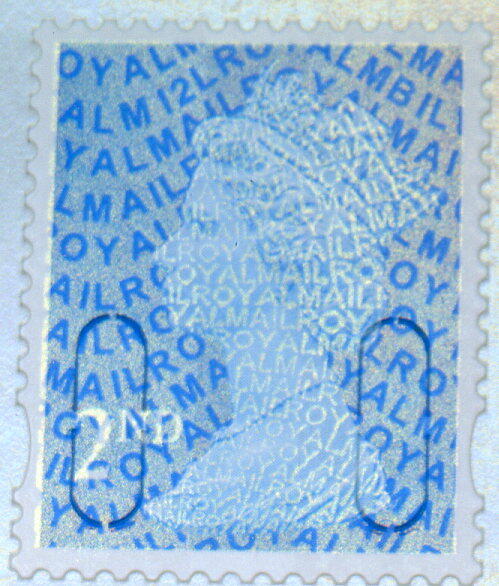 Recently discovered reprints are the £1 dated 12/01/12 and the 76p dated 10/01/12. 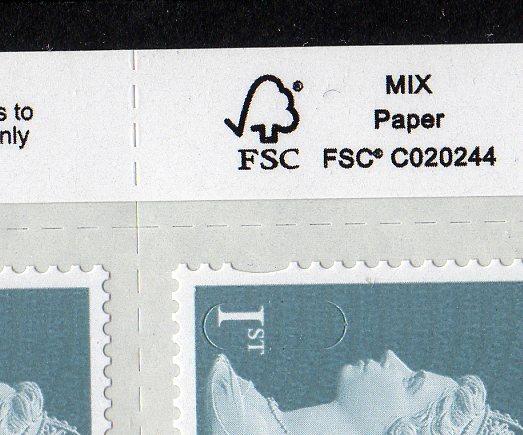 Both these are M11L, despite being printed in 2012. 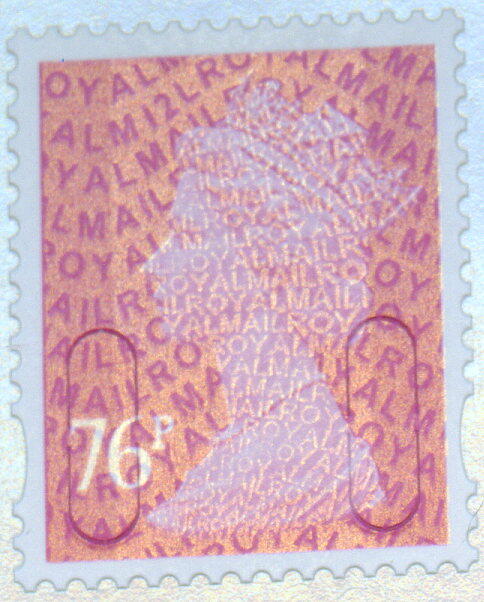 The 76p has also been founded dated (like the 68p) 25/01/12 with a M12L code. (Note the £1.10 and £1.65 will also exist M11L from 10/01/12 and M12L 25/01/12 if previous printing layout is followed.) It's odd that the £1 is reprinted again so soon as the last known printing was only 30/08/11. 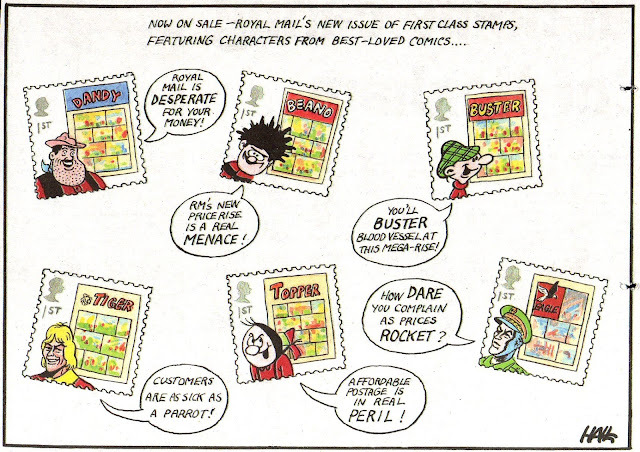 Back in January we reported a shortage of stamps at post offices and the early use of Roald Dahl commemoratives instead. 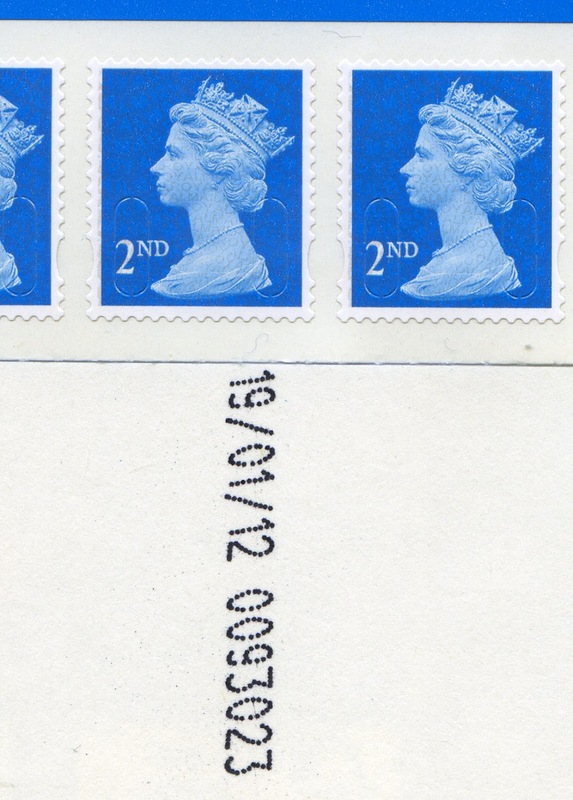 With the postage rate change not yet announced, and an heavy programme of stamp issues in the summer, the three printers on Royal Mail's books are going to be busy in the next few weeks!